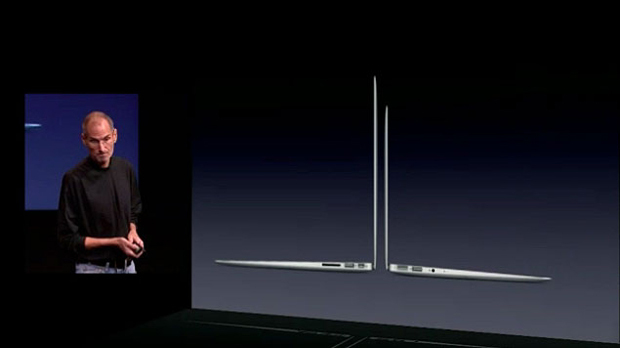 Steve Jobs shows off Apple’s latest MacBook Air, its latest operating system Lion, and the Mac app store. At Apple’s keynote today, it was all about the Mac. Steve Jobs promised he’d act as a “yo-yo,” throwing one product at us after the next. Here’s what Apple unveiled today. 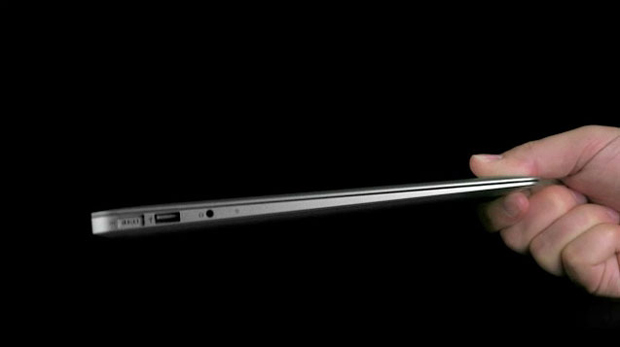 The new MacBook Air line has transitioned entirely to solid state storage, all flash memory–it has no hard drive or optical drive. The computer now boasts instant-on, silent processing, and is super light-weight–just 2.3 to 2.9 pounds. 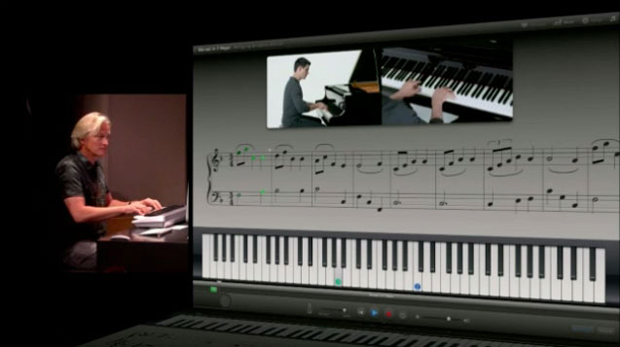 What’s more, the new notebook features a glass multi-touch trackpad, a full-size keyboard, and a Core 2 Duo processor. The larger MacBook Air has a 7-hour battery life and 30-day standby time, while the smaller one has a 5-hour battery life along with 30-day standby. 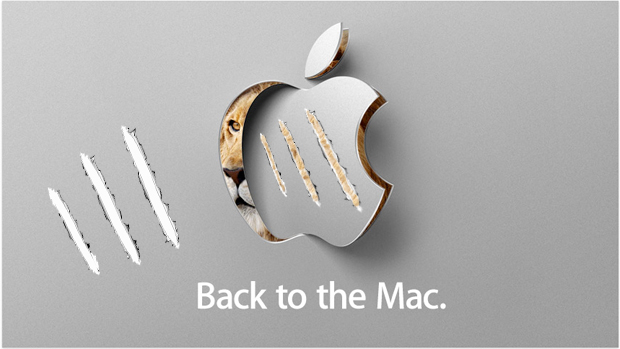 Continuing the theme of Jaguar, Tiger, and Snow Leopard, the eighth major version of Mac OS X will be Lion. 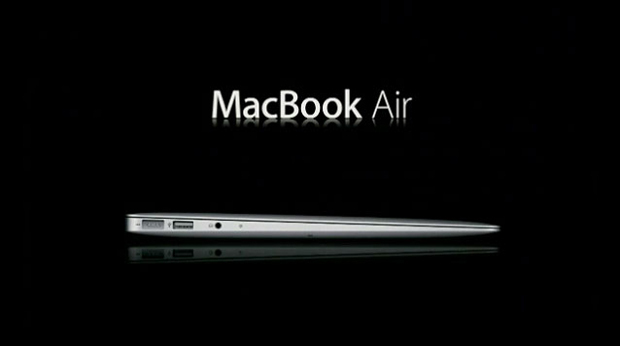 Apple’s newest operating system will be available summer of 2011. 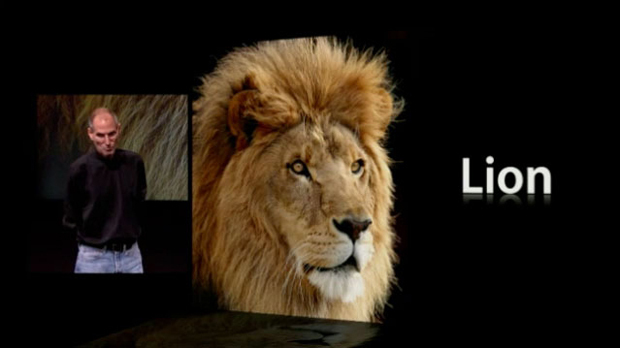 According to Jobs, Lion was inspired by the iPad. It takes its cues from the popularity of multi-touch gestures, the app store, and many of the features of apps, from home screens and full screens to auto-saving and auto-resuming. – Multi-touch. Jobs said Apple had considered a screen touchpad, but the company quickly realized it was ergonomically unviable. 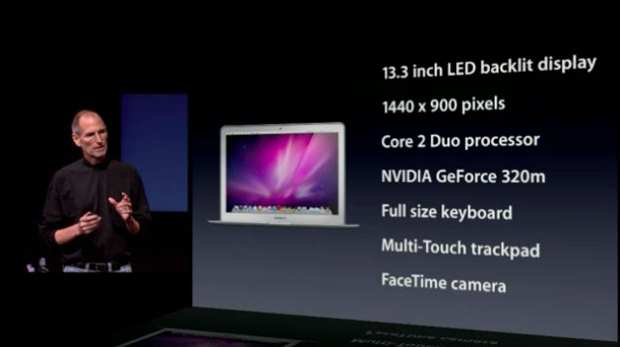 Instead, Apple will bring more trackpad-based multi-touch to Macs. – App store. “It’s going to be the best place to discover apps,” Jobs said. “One-click downloads, free and paid apps, automatic installation and updates.” The new feature will show up as an icon on the dock, and it should be available within 90 days on Snow Leopard. – Launchpad. Jobs called this a “a single place to put” all your apps and programs. 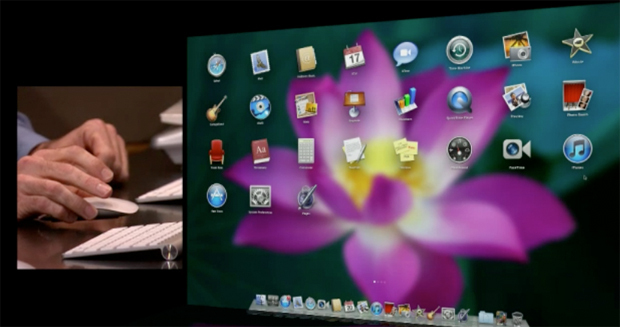 Essentially it is the iPhone or iPad homescreen, but on the Mac. – Mission Control. 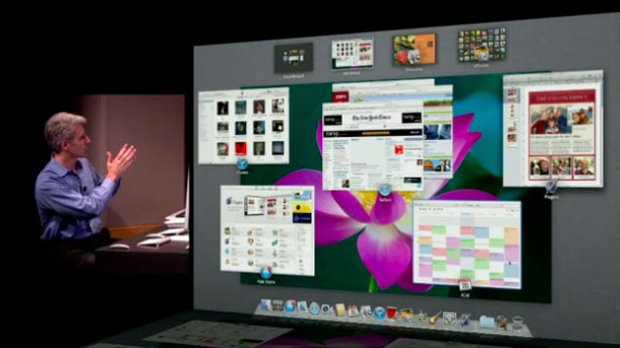 “It’s a way to view everything running on your Mac,” said Jobs. He mentioned Expose, full screen apps, Dashboard, and Spaces. “We have four of these things. Wouldn’t it be great to unify them all?” The solution: Mission Control, a control center for everything on your computer with Apple’s elegant user interface. 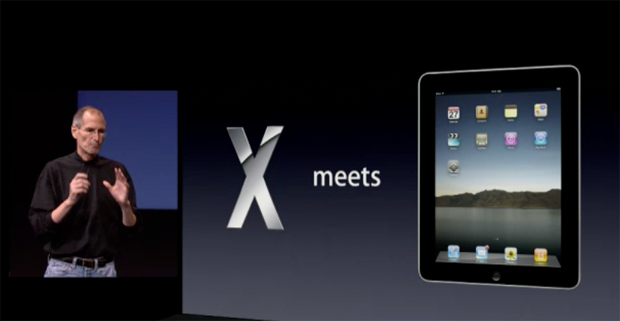 Outside Lion and the MacBook Air, Jobs discussed briefly Facetime, which launched four months ago on the iPhone 4. Apple has since shipped 19 million Facetime-enabled iPhones. Today, Jobs introduced Facetime for the Mac, and said Apple will now allow these devices to work cross platform, meaning one can Facetime from a Mac to an iPhone 4 and an iPod Touch. 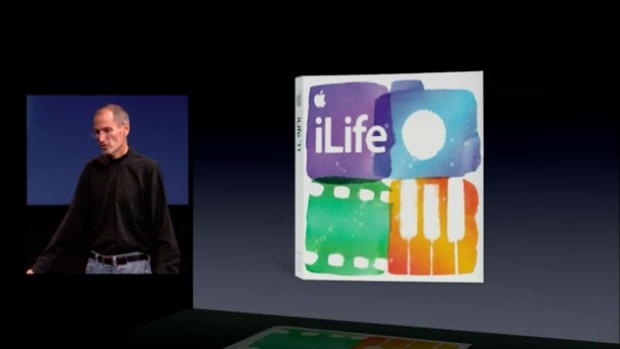 Apple also showed off iLife 11, the new version of its popular suite of apps. The demo today highlighted iPhoto, iMovie, and GarageBand. Phil Schiller, senior VP of worldwide product marketing, focused on iPhoto, unveiling a slew of new slideshow themes and sharing enhancements. The main new feature was the Places theme, which allows users to view pictures and albums by location. Otherwise the iPhoto revamp was full of predictable updates unworthy for an Apple presser. Background colors on photo albums? Text boxes? Wake me when it’s over. Jobs then turned to iMovie. This update offers better audio editing and automated movie trailers, which turns even your most boring home footage into a blockbuster Hollywood pic, dramatic music and credits included. The themes are mostly spun off classic cinematic trailers–Indiana Jones, etc.–and after the third one, we wondered when the demo would be over. “That was awesome,” Jobs chimed in. 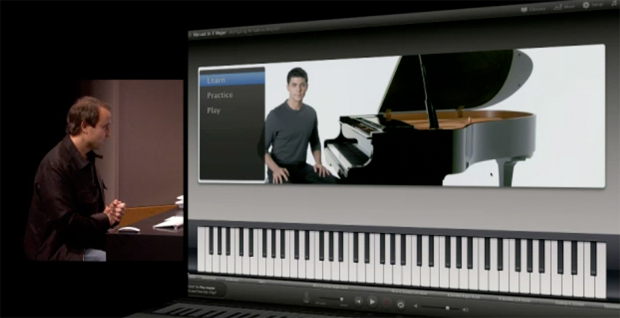 For guitar and piano lessons, GarageBand has video coaching with step-by-step, note-by-note breakdowns. Digital views are available so users can see where to place their fingers on the keys. It’s like Guitar Hero for someone who actually wants to learn the guitar–the notes are shown in green, red, and yellow depending on how accurate your playing was an how good your timing was. GarageBand tracks your performance, and shows your progress on a graph. GarageBand also has Groove Matching, which is “kind of like an automatic spell-checker for bad rhythm,” said one Apple head. Along with Flex Time, the features act as an auto-tune for beats, correcting bad timing. Anyone can sound like a virtuoso, in effect, with relatively little effort. As ever with an Apple keynote, the presentation began with some numbers that tell the story of Apple’s recent success. COO Tim Cook said he wanted to put the “Mac in context.” Last year, Macs dominated the market, selling 13.7 million units–triple 2005 sales–and has grown 27%, whereas the PC has only seen 11% growth. The Mac made up 33% of Apple’s revenue, earning $22 billion in 2010. “The tent of the Mac is getting larger and larger,” said Cook, spreading the word of the religion that is Apple. 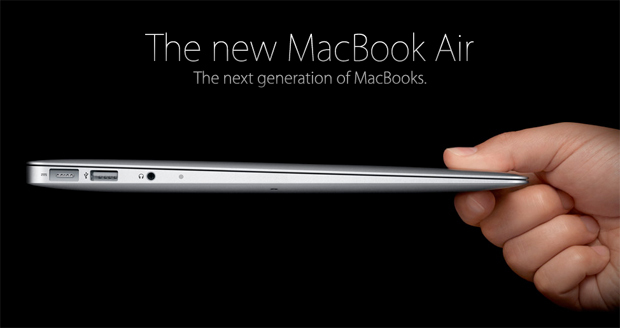 With a bold new version of OS X and a $999 MacBook Air, we’d have to agree.